Needless to say I’m looking forward to Cassini getting back to work and sending us more fantastic images, but I am also very glad the little fella’s okay up there too. If he needed more time to recoup you wouldn’t find me complaining. (Well maybe a little. But not loudly.) The mission is undeniably one of the most impressive and accomplished undertakings in the field of astronomy and I am honored to be able to share even just a few of its discoveries and images here on my site! The image above is a color composite of three raw data images taken in the red, green and blue color filters, from October 22, 2010. Combining these raw images and aligning them in Photoshop results in a full-color view of the scene, and while not technically color-calibrated it does give an approximate view of what the scene would look like to our eyes. 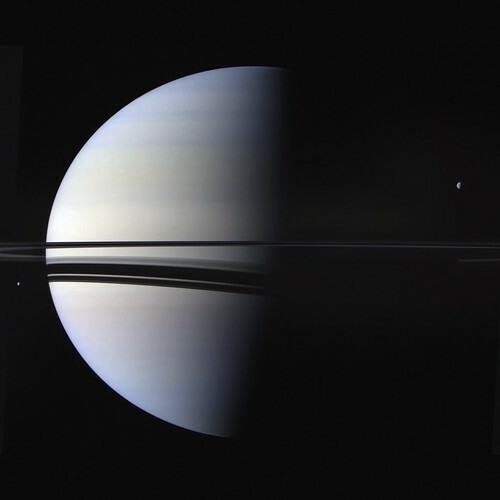 Cassini used its wide-angle camera to take the image of Saturn and its rings seen nearly edge-on, the ring shadows below, and two of its 62 moons. Click the image to view it on my Flickr page, or click ﻿here﻿ to see more color images of Saturn in my Flickr set. Image credit: NASA / JPL / Space Science Institute. Edited by J. Major. you are familiar with http://cyclops.org ? Yes, it’s CICLOPS (http://ciclops.org/) and it’s a great resource for news from the imaging team. I often check the raw image feed from the Cassini mission site first though.